IMCO solved another “Bravo” weaklink. IMCO’s new oversized gimbal ring is designed with additional mass to increase strength and reliability for high performance applications. Side load strength dramatically increased. IMCO’s new gimbal ring is constructed from A-356 aluminum and heat-treated to T6 full hard. Gimbal ring comes with all necessary pins and washers. Available in black or polished with clear coat finish. 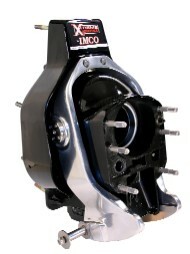 bellhousing is a direct replacement for installations using “Bravo” XR, XZ and IMCO XTreme Advantage SC drives. 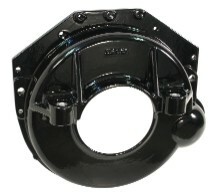 The new bellhousing is reinforced in all critical areas with additional gusseting around the motor mount area. There is a flange at the top of the housing for accessory mounting. Better... .and still affordable! and exhaust ports and its 10:1 compression ratio, allows your marine engine to develop even more power and torque over a stock 8.1L. All this with some weight savings of almost 100 pounds. In addition to the aluminum cylinder head, BIG POWER offers kits like the stainless 1.8 ratio roller rockers, “varalift” profile roller camshaft and Mahle piston specially matched for these cylinder heads. The addition of these kits combined with these cylinder heads, further enhances the power and performance gain you will get when using this whole package. Also shown above are the additional component kits available. the improvements the cylinder heads have to offer. The future is looking HOT for the 496 - 8.1 engine.